The RAL color system is used in Europe and many other countries. They have books of color samples and each color has a specific number. Their web site at www.ral-farben.de is in German but this is where I ordered my color chip selector (which was expensive) so I could find the closest match to what I was using. I have listed the RAL numbers for the paint colors I use, so that those who live outside the U.S. may be able to get the same colors of paint mixed more easily (if their paint store uses that color system). There are two RAL color systems shown. The one on the right is much more accurate. When you get your paint mixed, write down the numbers for both systems. There is no telling which system they use, or if they use RAL systems at all. This system is more common to find but there are fewer colors in it. These colors do not match mine as accurately. This has a lot more colors in it and I could match these more accurately. However, this system is not used as much. On this chart I have listed the paint colors and numbers from four common paint brands. Hopefully you have at least one of these companys' products where you live (in the US anyway). 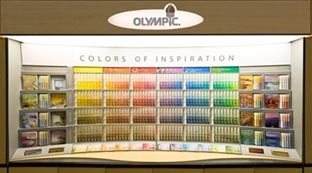 I used to list the actual paint recipies but stores sometimes change brands and use a different pigment system. For this reason, I have only listed the color's name and number. Not all of these colors are exactly the same colors as I use but I have selected closest choice possible according to the samples they had to offer. Of course you can always ask me for an actual paint sample instead of using this chart but this way you can get your paint mixed a lot quicker.